Record-breaking attendance and AV/IT convergence are the twin pillars of most InfoComm 2017 reviews. There’s another InfoComm takeaway that has more nuance but equally profound implications for the professional AV channel: the increasing influence of technology managers. According to statistics released by InfoComm International, 39 percent of visitors to the Orlando trade show and conference were "new attendees.” 41 percent of attendees identified as “tech managers and end users”—the highest recorded figure of its ilk. Owen Ellis, chairman of the AV User Group, an AV user networking and educational community with a global footprint, agrees that 2017 is a banner year for in-house AV technology teams. "InfoComm succeeded in demonstrating the importance of the end user,” Ellis said. While impressive, the 41 percent end-user statistic should not be entirely surprising as it reflects the current state of the pro AV industry, Ellis argued. In the past decade, tech managers have become stronger influencers in the AV acquisition process. Additionally, AV Technology surveys reveal that approximately 30 percent ofsubscribers—managers in AV and IT departments—conduct their own needs analysis, procurement, and AV integration processes. New initiatives contributed to the diversification of attendee profiles in Orlando. The inaugural TIDE Conference and The Center Stage, brief but spirited presentations styled after TED Talks, appealed to trades allied with AV integration, i.e. experiential design, architecture, exhibit design, VR, AR, and live event management. "The TIDE conference on Tuesday, being run the day before the exhibition and with high quality topics and presenters, was particularly well received,” Ellis said. Additionally, The Park, outfitted with beer carts, "food trucks," and lawn games, offered a balance between functional and whimsical—an ideal place to network as well as play Jenga with new industry friends. “The fact that the show attracted such a high percentage of end users (in addition to their partnership with the AV User Group) demonstrates InfoComm’s strategic focus on this sector of the market and the success they’ve already achieved,” Ellis added. On the InfoComm exhibit floor itself, a panoply of software-driven AV over IP products echoed the tech manager focus. Brand messages like “Built for IT,” “Software-Defined,” “Remote Management,” “IT-centric,” "Cloud-based," and “Programming Free” from manufacturers like Cisco, Utelogy, QSC, Aptovision, Kramer, Atlona, and Barco suggest an emphasis on intuitive solutions and services that make sense for on-site tech directors and media managers. To that end, InFocus used the InfoComm spotlight to launch its ConX Cloud which offers business-grade, scalable, SIP-based video collaboration service for virtually any BYOD user. To call its price structure aggressive would be an understatement (free up to three users). Also notable is how ConX Cloud rounds out the company's hardware and software ecosystem.As more AV processes move into IT departments and onto the enterprise network, AV/IT managers testify that they are interested in software-centric solutions and remote management. AV as a service (AVaS) and scalable service models are also growing in demand. Cory Schaeffer, director, Systems Solutions for QSC, concurs. She was excited to see the rise of end user attendees and believes it reflects a "true indication of the shift in our industry." Schaeffer added that supporting these new customers is a key focus for QSC. "We are dedicated to learning more about their environments and partnering with them to develop AV&C standards. In terms of technology, we believe this also indicates the need for less purpose-built solutions and more software-based platforms." QSC engineers acknowledged and responded to this trend when developing Q-SYS 10 years ago, building "a fluid platform around standard IT technology," Schaeffer explained. "This has allowed us to add the Q-SYS real-time operating system to standard Dell server hardware. It is the first solution in the industry that allows end users to easily integrate AV&C processing with current IT platforms." Like in Mike Lucas's experience, many IT departments are absorbing traditional AV responsibilities, resulting in an increasing percentage of tech managers needing to increase their "A" and "V" skill sets. According to Amanda M. Roe, Biamp's Global Public Relations manager and research manager, as in-house technology teams expand their purview, it is also incumbent on manufacturers to understand the complex issues faced by users. "We’re communicating with end users (tech managers, CIO, IT directors, etc.) so that Biamp understands their problems and challenges, and have solutions that will address their pain points—including the ones that have yet to surface," Roe said. This communication is concurrent with the company's channel relationships; Biamp works closely with its community of integrators, consultants, and system designers so "this message of understanding is clearly conveyed through their interactions with end users," and, as Roe explained, "that they are fully trained to be able to troubleshoot and anticipate end user situations and needs." Tech managers are invited to download the Guide to InfoComm 2017 and continue the conversation at our AV/IT Leadership Summit in Denver, August 3-4, 2017. Margot Douaihy is the editorial director of AV Technology. 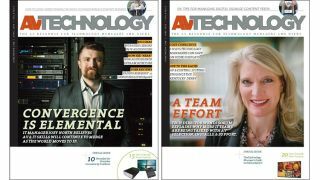 Follow her @AVTechnologyMag.